If you like racing on the streets (of Mexico); you will love this video! I almost laughed when I saw a turbocharged Volkswagen Corrado at the outset of this production – then the VW whipped a couple of Corvettes and a Camaro. The Sketchy Vert WS6 Trans Am was a little more than he bargained for but most street racers find that to be the case, All in all, this was not a bad night of roll racing for a four-banger VW. From there, it’s on to some dig racing. 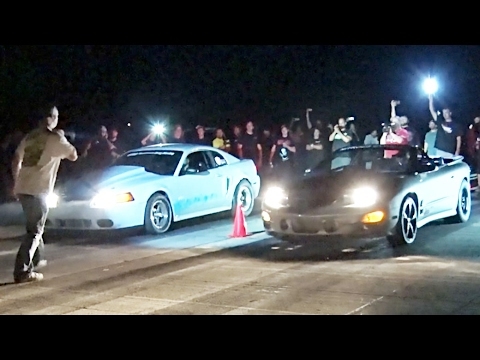 There are some pretty average rides to begin the night – then the turbocharged, blown, and nitrous injected monsters showed up to tear up the street. This is a great variety of street cars – from daily driven hot rods to big tire beasts – so there is something here for everyone. The Sketchy Vert, a turbo Pontiac Trans Am WS6, shows up here too but is putting a bit too much power down and has to pedal the car down the 1320. He is all over the lane. There is also a cherry red vintage Camaro that throws his hood half way through his run; if you are into that sort of thing.